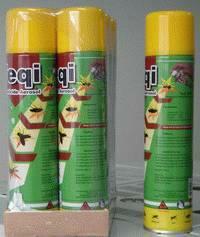 TeqiAerosol is Public Health Insecticide, used for killing Mosquitoes, Flies,Cockroaches and Ants etc. target pests. Its active ingredients are 0.3%Tetramethrin and 0.25% Permethrin. Packing is available in net 300mL or 600mLtinplate pot. At meantime, we also can produce tinplate pot according to yourprinting requirements. Now we are exporting Teqi aerosol to Ethiopia andtinplate pots to Isrsel. For more details, please contact us at 008651988104983by fax or visit http://www.fulllongchem.com We sincerely hope that we can establishand develop new market through the close cooperation between you and us.